Meghalaya, one of the seven sister states of North East India, is inhabited largely by tribes. 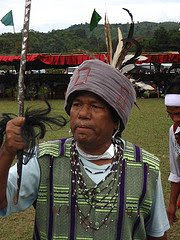 After Khasi, Garo comprise the largest population of tribes in Meghalaya. Most of these tribes habitat in Garo hills of Meghalaya, as the name depicts itself. Other than Meghalaya a sizeable population of these tribes can also be found in other states like Assam, Tripura, West Bengal and Bangladesh. It is believed that Garos migrated to Meghalaya about 400 years ago from Tibet. Garo people are also known by the name of 'Achik-mande' or hill people. As almost all the states in North East India were explored by Christian Missionaries, most of the Garos adopted Christianity. These tribes speak Garo language, which is also further divided into different sub-languages or dialects. In Garo tribes, women are the owners of property thus making it a matrilineal society. There is a custom where the youngest daughter inherits the property from her mother and man shifts to his wife's place after getting married. These tribes are also lovers of music and dance. They use various traditional musical instruments like stringed instruments, wind instruments and self sounding instruments. Men flaunt turban with clothes in villages. Whereas, blouse and a cloth tied around their waist is worn by Garo women. They also love to wear traditional jewellery made of beads and other material. Garos also celebrate different festivals. Wangala is one of the significant festivals of these tribes which is generally celebrated in the month of October. This festival is celebrated after the harvest of crops as thanks giving ceremony to their deity Salijong. Rice is the staple food of Garos and most of them are non-vegetarians. They also make liquor at home from food grains. Their main cultivation crops include rice, ginger, millet, bananas, vegetables, pepper, chilli and cotton. I like your blog. I used one of your pictures here. Your blog provides a one-stop resource for information related to different tribes of India. I have linked your blog to one of my posts. Thanks Satya and Adarsh for your appreciation. Hope you like my articles in future also. Well... Superb website, I'm (a student) pretty satisfied with what I read. Thank you. I just felt if I could help you to make a better website.